Exceptional service and great advice lead me to Craig and this pellet. The tins come with one foam liner in the lid and the one I have shot through had no deformed pellets in it. I am not at a level of measuring and weighing pellets at this point, however, I do single load into the breech and each pellet has the same feel and none have been over tight or the opposite – loose. Each engages the rifling and inserts with the same predictable mannerisms. I have had some JSB’s in the past that varied so much within the same tin that I felt like I should have received several different tins. The results on target were as expected. 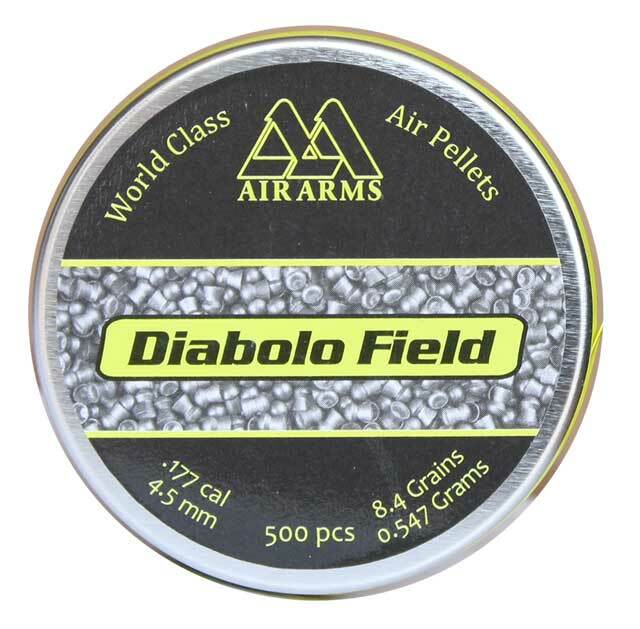 The results with these Air Arms pellets have been tremendous from my TM 1000. Every pellet going were I aim each time I pull the trigger. I have not been disappointed by the quality control and it is obvious to me that they are sorted well at the factory before going into the tin. Nice tight groups and consistent FT performance. Equally at home on paper or on the range knocking down FTs. Advantages: Consistent shot to shot performance. Clean pellets inside the tin and leaving little residue on the fingers. No damaged pellet skirts or deformed heads. Steady goes the trigger pull and aim and on target goes the pellet. Disadvantages: Availability of the 4.52 head size. Hard to think of any other disadvantages. No screw on lid – just use one from a big box store brand pellet and relabel the tin.